It’s really easy to blame society and the media for our skewed body image. The rampant over-use of Photoshop, glorification of malnourished bodies, and the impossible standards set by magazines and TV/film are clearly part of the problem, right? Yes- her waist is VERY small. But she shouldn’t be demonized for it. 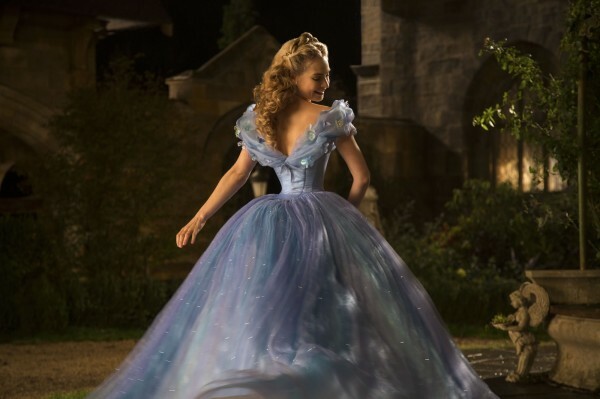 Lily James having a naturally small waist, and having a costume designer who utilized a tight corset and an unusually full skirt are NOT the root of our collective body image problem. While yes- I do wish there was at times more representation of more body types, I really don’t feel like it’s fair to continually point fingers at the media all day and criticize actresses for their naturally slim bodies, either. Our body image problem is not just the media’s fault. How many times have you heard negative body talk among friends and family members? If you’re anything like me, it’s probably been more times than you can count. It’s almost like women are so conditioned to hate their bodies that it seems jarring when someone doesn’t. How messed up is that?! The normal reaction to the above statements are generally to reassure the woman who stated them that their thighs, are in fact, not as “large” as they say the are-and then find a flaw of their own to pick on. But I think it would be more effective if we could just learn to express more positivity at our own bodies, instead. Because a passive, “No…you’re not fat!” Doesn’t really do much to improve our negative body image problem. Let’s be real. While we don’t need to go around being arrogant- I think a realization that “Hey, my (insert body part here) isn’t necessary “ideal” according to society but I love it anyway! Who cares what anyone else thinks? !” can be far more effective. And really though, when did it become such a crime to be confident and love who you are, flaws and all? I just think that’s so powerful! So I really don’t think the media is the only one to blame for our chronic negative body image. Sure, it plays a part. I’m not naive. But not as big of a part as others may think. It honestly begins with our family. We learn from our mothers, our aunts, and our sisters that we aren’t good enough the way we are. Thy don’t mean to pass that along, but they do. With every critique, with every negative conversation targeted at their bodies and listing all the reasons they don’t feel worthy of feeling beautiful. The thing is- the more we hear from our peers and those close to us that these actresses and models in the media are the “ideal” the more this is reinforced. If we can all just accept that “Hey, we all have different bodies and that’s awesome!” We’ll all better off. It’s not just that these body types are just promoted in the media- it’s that we all see it and turn it into an aspiration instead of accepting we all have different bodies. WE make that connection and pass that connection along as the archetype. But we don’t have to! Why can’t we instead reinforce the idea that an “ideal” just doesn’t exist? That what is “ideal” can just be our healthiest, happiest version of ourselves? So if we want to really break this cycle- it starts with us. It starts with our conversations. Conversations with our friends, with our coworkers, with our sisters, and with our daughters. We don’t want to raise a generation that starts thinking they’re fat at 5 years old. But sadly, it’s already here. What we need to do is reinforce to the females around us that while it’s important to strive for health- there isn’t anything to be gained from continually loathing our bodies. Also- our self worth is NOT contained in the width of our thighs. Let’s teach our young girls that they are beautiful the way they are. 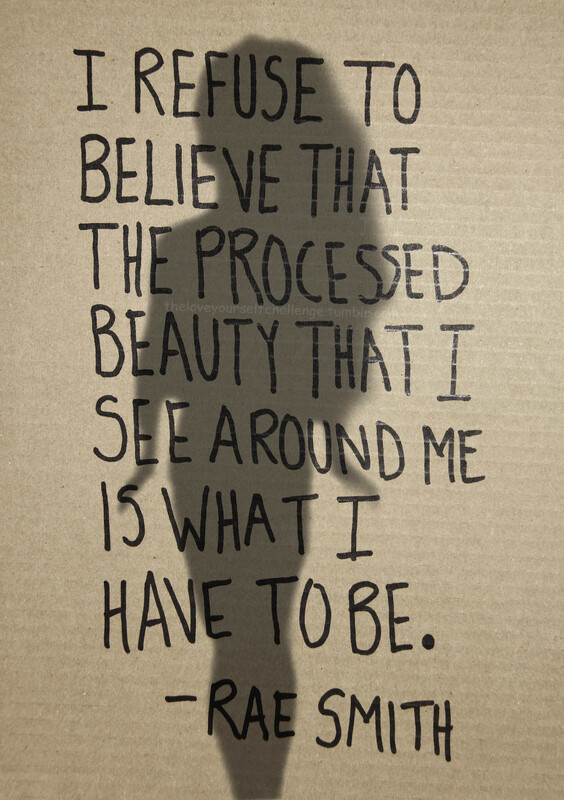 And not only that- but that being beautiful is not the ultimate measure of their self worth. That they are bright, unique, smart, individuals that should be respected. That they should honor themselves by NOT tearing themselves down every time they look in a mirror. That no matter what the number printed on the label of their jeans says- they are worthy of love and of making a positive difference in this world! This is a message that not just young girls- but women of all ages need to hear. And hear it often. But they’ll never believe this unless WE make that change within ourselves to realize that WE are enough the way WE are. Once you can believe that for yourself- you can influence somebody. And that somebody can then influence somebody else! And maybe over time- we can change the landscape of body image to be one of growth and empowerment instead of shrinking. Want to get started spreading some positive body image? Here are some fantastic images I’ve found on the net. Pin them, post them on Facebook, Instagram them- spread them around! Also make sure to check out the #REALFITSPO Project (Issue 1 and Issue 2) for more real life examples of positive fitness inspiration! I'm an actress and web designer who believes in living life as creatively as possible and in inspiring others to love themselves and live an unabashedly empowering life. Strong Isn’t the New Skinny. I’ve Barely Worked Out in 2 Weeks- and I’ve Never Been Happier.